One of the great things about living in an up and coming neighbourhood is that you get to see all of the changes that take place. New clothing boutiques. New coffee shops. Boulangeries. Food markets. 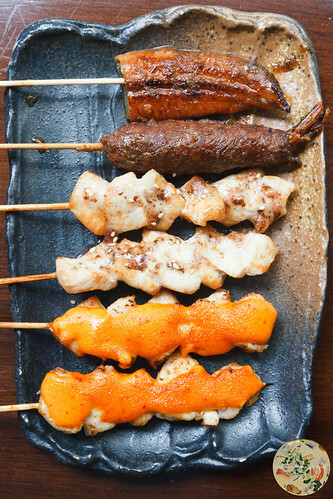 A yakitori. When I am not driving, I take advantage of public transportation and I can see many businesses pass before me. One that caught my eye was in an area that once housed a once-defunct bar that seems to have become a part of the growth in my neighbourhood of Logan Square. What was once a dive is now a high-end boutique restaurant that panders to the yakitori style of cooking. Lucky for me 2853 N. Kedzie Avenue is not far from where I live, which means that Yusho is now on my list of restaurants in my vicinity to visit frequently. Common with many boutique restaurants, you experience ambience and some rather nice boutique jazz or lounge music that can be rather hypnotic. 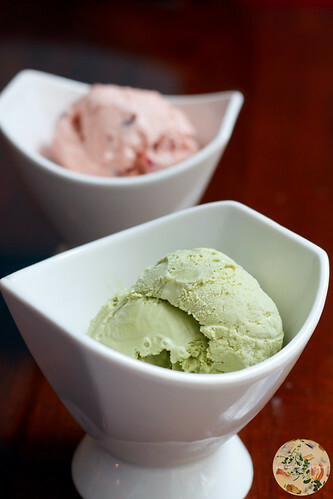 Yusho is a restaurant for a date or for meeting friends. For me, it was a chance to see if this addition to the Logan Square neighbourhood will warrant several encores. Perusing the menu, I started with a pisco punch. 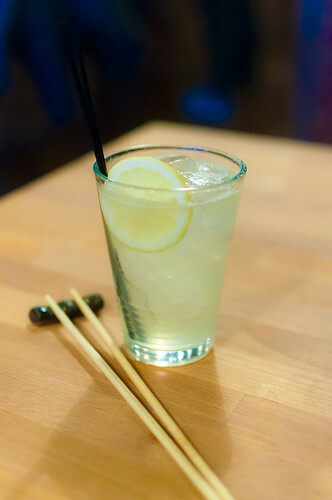 Something that I could certainly see myself indulging on a hot summer day, the glass of Don Cesar special pisco, sencha, pineapple, and umeboshi gomme syrup, and garnished with lemon, gave an indication that the bartender on staff deserved an applause. Usually when drinks are well-balanced, the flavour is flat. Not that I am a beverage guru — or snob — but it was easy to tell which ingredients made the liquid concoction without any of them being tempered or overpowering. Mind you, I had come to this conclusion after about four sips, after which it was time for me to give my first round of orders. For starters, I let go of my purist food wagon and rolled around in the dirt, muck, mire, spices, seasoning, and bliss. As I am not one for eating fried foods, having given that up years ago to avoid my doctor shaking her head because of heightened blood pressure, I cannot say where the voice came from that requested fried chicken skin. Sure enough, that was what came to the table. 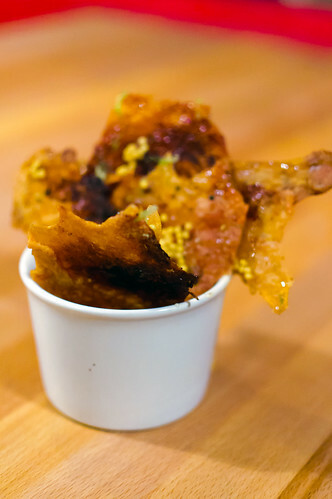 Reminiscent of wafers served in Indian restaurants as appetizers, but clearly not wafers, the thin chicken skin had a smooth texture, not the bubbly, crispy coating that you see on chicken that had been swimming around in hot grease. And, no, it was nothing like the awful pork rind skins that you buy at the market or at gas stations. Brushed with Japanese mustard, garlic, and togarashi, the pescatarian in me had not one regret for polishing off the skins. I was off to the great start with just the cup of doctored-up skins and wondered what else I could request to come to the table to best the first order. Second to the table was another item that I have avoided for over forty years — oysters. Granted these were not the oysters that you dip in hot sauce and lemon before letting them slide down your throat, that being they were grilled oysters, they were oysters nevertheless. 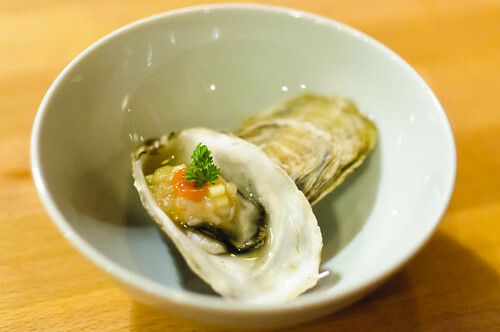 Grilled and accented in apple cider, sake, and tapioca, I said to myself, “Bottoms up,” and swallowed what was nothing akin to the deterrent I have seen people indulging in numerous seafood restaurants. The taste did not leap about in my mouth, but I smiled anyway now knowing that I can enjoy grilled oysters. Well, I had to admit that although this was my first experience eating oysters and finding satisfaction in it, other restaurants may send something to the table to murder my new-found love. For my third course, I rolled my eyes about and fought the urge to stand and shout before throwing a dish on the floor. The eel with brandade, hominy, and wasabi mustard was so delicious that had I not been a prude I would have shown a side of myself in the restaurant that would have had me removed. By the third bite, I was on my cell phone looking for a recipe. I had to have more and in larger quantities. What sat before me shortly before I let out a muted whimper because I had finished it and wanted some more to savour was a tease. It was wrong. The bowl of pleasure should have been tasteless, rubbery, disgusting. But it was anything but that and I had pondered ordering the dish again. Instead, I heaved a heavy sigh and made plans to walk back to the restaurant in a few weeks for more. The first yakitori dish that I feasted on was chicken thigh. However, looking at it would have most rabid rural food critics arguing that I had skewered meatballs. The chicken had been prepared as meatballs with Anaheim peppers, basil, and topped with savoy cabbage. Such beautiful presentation of the three meatballs on a skewer only to be messed up with me gnashing away at the tender, succulent, addictive meat with proper etiquette. 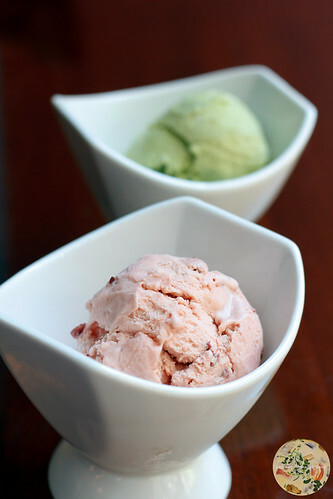 Talk about satisfying to the palate. 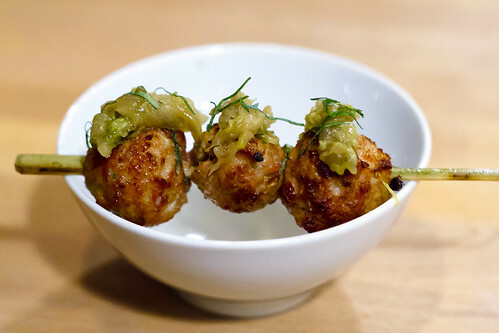 Talk about meatballs being a thrill to the taste buds without being doused in some gravy. Talk about a recipe because I would be interested in trying this in my kitchen — at least once. By now I had conceded that I will be regular at Yusho. And just when I thought that I could not have anything sitting before me taste better than what I had eaten already, the sea urchin changed my mind. Wrapped in a crispy pastry with nori, shiso, and Buddha’s hand, I logged on to Facebook and posted that I am indeed a food addict. The anise flavouring from the shiso gave an accent to the sea urchin that would have otherwise left the sea urchin simply palatable as opposed to its incredibly luring taste. The marriage of the shiso spice and the citrus and ginger flavouring of the Buddha’s hand had me wanting to go to the kitchen and bow before the chef. 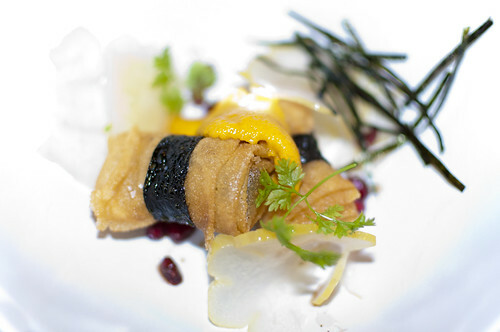 While the shiso and Buddha’s hand are perfect complements, the seasoning still allowed the sea urchin to have the spotlight. And that was fine, as I showed the urchin just how much of a star it was in my show. Now right about now is when I would write that I was done, stuffed, ready for a nap. 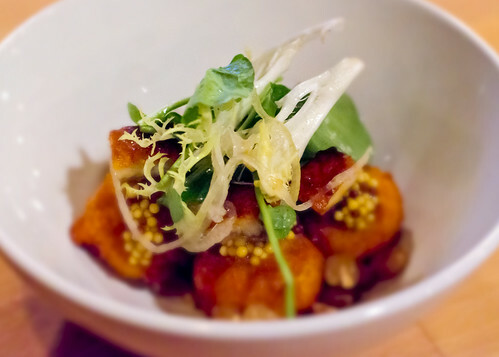 But the portions at Yusho are taste size, which meant I was ready for more action. Rather than launching into another appetizing dish, I settled for a moment to collect my thoughts with regards to what else I would sample. While waiting a while I ordered another drink from the bar. 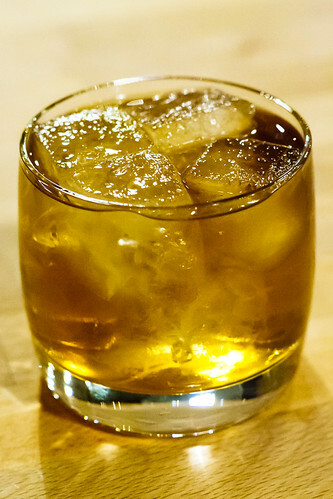 This time I wanted to try something with a whisky base to it, recalling how much I prefer a scotch or a whiskey anyway. What to my wondering surprise should I espy a drink called Two Tribes. Concocted of redemption rye, palm sugar, cardamaro, and barrel-aged stone fruit bitters, whiskey sour and amaretto sour quickly became passé in my book. Next time I shall order the drink neat and nurse it until closing. Okay, perhaps not until closing, but I shall enjoy it in the same fashion that I enjoyed the Two Tribes this evening. Having given myself a bit of a respite, I was ready to continue. Why does it sound like a hiking expedition? 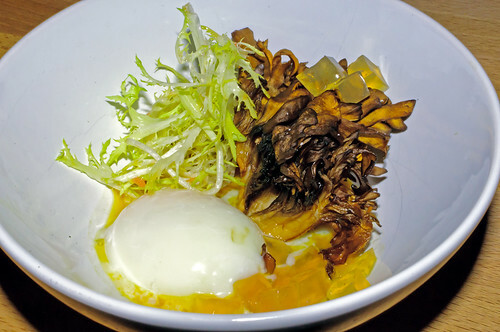 I have no idea, but the bowl of maitake mushrooms with egg vinaigrette and dashi gelée made the wait worthwhile. One thing I will say as a footnote is that I am not a fan of my eggs becoming Olympians and running all over the place once you get started on them. There is one other restaurant in Chicago that had changed my mind and the egg vinaigrette at Yusho has really made me completely accept that runny eggs can be a culinary magnet when seasoned delightfully. The mushrooms held their own, but once I had broken the egg and mixed it all together, my prudish sensibilities had long taken leave and I was left to enjoy every dish that came to the table without complaint. Sticking with a vegetarian option, I went down the exotic path — not that I had not been doing that all along. I had never had gobo root and wondered what it tasted like. One of the good things about being experimental and curious about certain foods — except for Chinese street food — I had decided to order something very much in a whim manner. 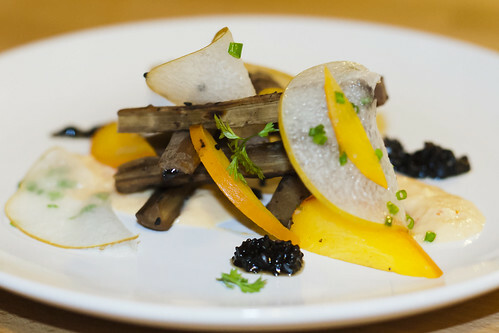 This dish came with sesame, Asian pear slices, and persimmon. How would I describe the texture of gobo root? I would say that it is like sugar cane without the strands. How would I describe the taste? I would liken it to artichoke, but with a bit of a sweet accent to it. How would I describe my first dining experience eating gobo root? I cringed. I winced. I pouted. I wanted more and having finished the main course with the accompaniments, I was in complete happy mode because everything to this point was outstanding. You never want the moment to end. But all good things must come to an end. For me, it came with a climax. Let me put that in perspective. 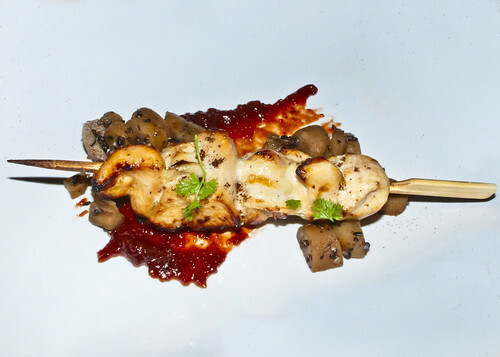 The final dish was a yakitori of chicken breast with gobo root, quince, and five spice. Throughout the whole meal, everything was rising action and then a climax of succulent chicken in a sweet red berry sauce that had left me speechless. Just to see if the chicken could appeal to my taste without the sauce, I plucked a bit and sampled it alone. The chef must have known that someone like me would try to see if the chicken alone could induce a wide smile. My compliments to the chef for success. Knowing that this was my final course and it being so blooming magnificent, I savoured each bite for as long as possible. 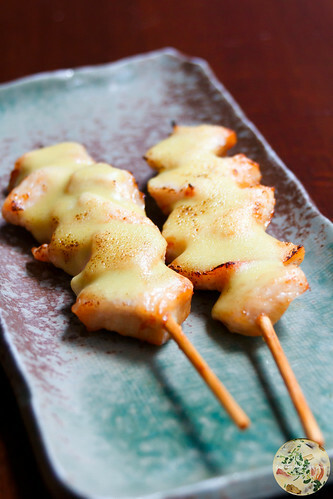 Much like yakitori that I had in Japan, the portions are small. 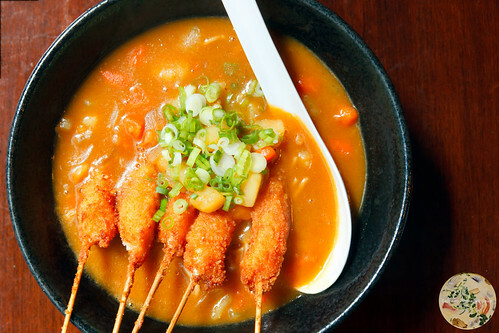 Street food is not to be eaten as entrées anyway, so if you go to Yusho, be forewarned that everything from the menu comes as a taste. I actually liked that, as I got a chance to sample several dishes instead of being weighted with one or two main courses. This also means that I shall have to return and try some other menu items, as well as a few that I sampled on my first visit. For such small portions and the ambience and presentation being chic, I was expecting a large tab. Much to my surprise, I was very happy with the bill. Great service, outstanding food, and a calendar entry for a return date, I walked away incredibly pleased that Yusho chose Logan Square for business. 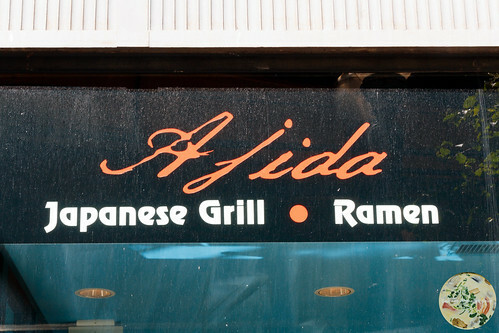 Oh, my appetite says, Thanks, too.